Matthew Simmons has received quite a bit of press in the past week, after his Ocean Energy Institute floated a proposal to build a $25 billion, 5 GW wind farm in the Gulf of Maine. Offshore wind farms have a number of advantages over their land based equivalents - they are less hazardous to wildlife, have fewer objections raised on NIMBY concerns and winds are generally stronger over the oceans than they are over land. Ideally, offshore wind farms will be far enough away from land to avoid being seen from the shoreline, eliminating any residual objections from local residents. Current offshore projects tend to site turbines in waters less than 20 metres deep - going further offshore would mean locating them at depths of 50 meters or more, which is too deep to build supporting towers or trusses down to the sea floor at an affordable cost. A solution to this problem is floating platforms - one of the key elements of the Ocean Energy Institute proposal. In this post I'll look at some of the work being done to develop floating offshore wind power platforms in order to enable these sorts of schemes to become a reality. According to a 2006 report by the U.S. Department of Energy, General Electric and the Massachusetts Technology Collaborative, offshore wind resources on the Atlantic and Pacific coasts of the United States exceed the current electricity generation of the entire U.S. power industry. 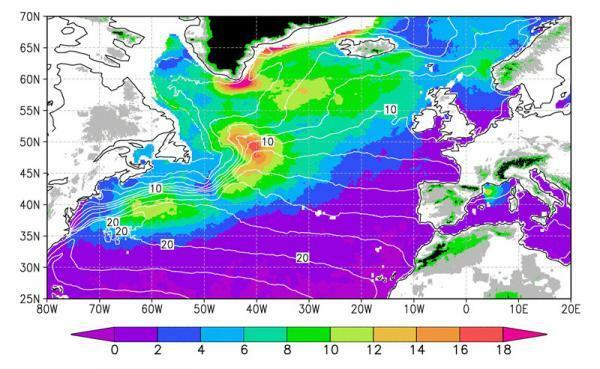 NASA has also been investigating ocean wind strengths worldwide, using the QuikSCAT satellite. Researchers at MIT and elsewhere have been investigating the feasibility of "tension-leg" platforms for wind turbines, a technology that oil companies have been using for deep-water rigs. The structures would be assembled at a shipyard and placed on large floating cylinders that are ballasted with high-density concrete (to keep the structure from tipping over) and then tugged out to sea. 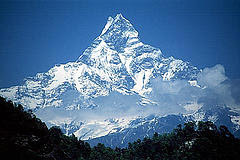 Once in location, steel cables would be attached to the platform, anchoring it to the sea floor. The MIT researchers claim that large turbines located far offshore could eventually generate cheaper power than both land based wind farms and near-offshore ones (even taking into account the increased cost of longer underground electricity transmission cables). Part of the cost advantage is the higher capacity factor achieved due to more consistent offshore winds - potentially averaging between 40 percent and 50 percent compared with 30 percent or less with land based turbines. Some offshore wind farms could also have advantages in terms of proximity to large coastal cities compared to wind farms in remote areas, which require grid transmission upgrades to transport the power to places where it is consumed. 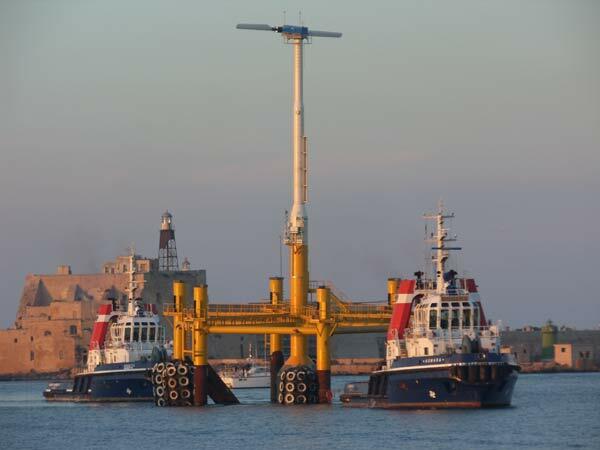 Floating offshore wind farms also avoid bottlenecks in the supply of marine construction equipment such as pile drivers and cranes that may hamper rapid expansion of shallow offshore wind structures (however they may instead compete for some resources with offshore oil exploration and production, which could be problematical in the short to medium term). A number of companies are active in the area of floating offshore wind technology - primarily Blue H Technologies, StatOil Hydro and SWAY. Blue H Technologies is a Dutch company that launched their first test platform at Tricase off Italy's southern coast late last year. The company has also announced plans to install another test turbine off Massachusetts. The Blue H test platform in Italy is a tension-leg platform - a conventional offshore oil and gas platform design that floats below the surface, held in place by chains running to steel or concrete anchors on the seabed. The platform is located 10 km offshore and hosts an 80-kilowatt wind turbine which is mounted with sensors to record the wave and wind forces experienced by the equipment. Blue H is now constructing a commercial wind farm for the Tricase site, which will have an installed capacity of 92 MW. Blue H's design is unusual in that the turbine has a two-bladed rotor rather than the conventional three-blade design used elsewhere in. Technology Review has quoted Martin Jakubowski, Blue H cofounder and chief technology officer, as saying that "the noise and jarringly high rotation speeds that made two-bladers a loser on land are either irrelevant or a plus offshore" and that the fast rotation is "less susceptible to interference from the back-and-forth swing of the platform under wave action" and means less torque, resulting in a lighter structure (Blue H's 2.5-megawatt turbine will weigh 97 tons - 53 tons lighter than the lightest machine of the same power output on the market). Tech Review also quotes Jakubowski as estimating that Blue H's wind farms will "deliver wind energy for seven to eight cents per kilowatt-hour, roughly matching the current cost of natural gas-fired generation and conventional onshore wind energy". Norwegian oil and gas producer StatoilHydro and Germany's Siemens (a major wind-turbine producer) are partnering in a project to build a commercial-scale floating wind farm about 10 kilometers offshore from Karmøy on Norway's southwestern tip. StatoilHydro initially plans to operate a 2.3 MW wind turbine atop a conventional oil and gas platform, and is hoping for this to be operational in late 2009. Unlike the Blue H design, StatOilHydro is using traditional wind turbines. 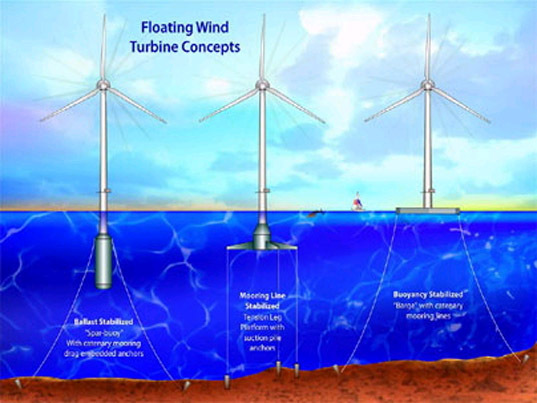 The company believes floating wind farms are the way of the future, with a company spokesman saying that there are a declining number of sites available onshore and in shallow waters and citing regions without a shallow continental shelf like California, Japan and Norway where traditional offshore wind is not possible. StatOilHydro says that deepwater wind power will be expensive in the initial stages but that the economics could eventually rival those of conventional wind power. If deep offshore wind power in the North Sea proves to be successful it would become a major component on the planned European Supergrid, which backers hope will link up the region's power networks and allow a much higher proportion of renewable energy in future (possibly entirely fossil-free, as it will need to become eventually). 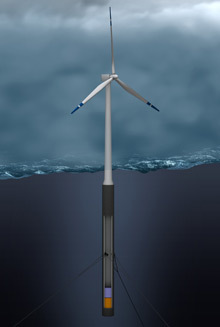 SWAY, based in Bergen, Norway, plans to field a prototype of its floating wind turbine in 2010. SWAY's platform is basically a spar buoy that can rise and fall gently with wave action, requiring less anchoring than the tension-leg platform. The buoy, mounted on a column nearly 200 meters tall, is held in place by a 2,400-ton gravel ballast. A three-bladed turbine is used, but, unlike conventional onshore turbines, it faces downwind rather upwind to better accommodate heeling of the tower, which may make it more effective in rougher waters than alternative designs. The cost estimated for Simmons' plan is $5 billion per gigawatt — more than double the amount that T. Boone Pickens’ now delayed wind farm in Texas is supposed to cost. This seems high if the cost savings expected by the companies mentioned above eventuate, with the StatOilHydro experiment probably being the best guide, with the North Sea facing similar weather challenges to those experienced off New England. Winter winds in the Gulf of Maine carry as much as eight times more energy as summer breezes, meaning maximum power is available during periods of greatest demand. About 80 percent of Maine residents use oil to heat their homes. The average family uses about 1,000 gallons, or 3,785 liters a year - when prices are around $4 a gallon ($1 a litre) this consumes about one-tenth of the average family's annual income, leading Simmons to declare "If we don't do this, we're [eventually] going to have to evacuate most of Maine". Seen in that light, even an expensive offshore wind farm is better than the alternative. As an added bonus, construction and maintenance of the structures will bring valuable job opportunities to a region hard hit by the decline of the fishing industry.